Students and teachers can become complacent, and even bored, if every lesson is the same week after week and year after year. You can shake things up a little with these tips and tricks to create lively lessons and aid in student retention. You don’t always have to teach the way you were taught, nor the way you have always taught in the past. Divide the year into four or more segments and concentrate on two or more topics per segment.Fall might be scale contests and studying the music and composers of the Baroque, transitioning to contest preparation and stage fright for the winter. For spring you might turn to musicality issues and listening to a favorite artist, and then work on posture, position and sight reading over the summer. Use outside resources. Students appreciate learning from other teachers and you will too. Set up master classes, attend contests, or invite a substitute teacher if you take a vacation. Keep learning yourself. Subscribe to music magazines, read books, listen to TED talks, explore the internet, and set aside time to listen to new and classic recordings. Everything you learn is something you can bring to your studio. Attend conferences. 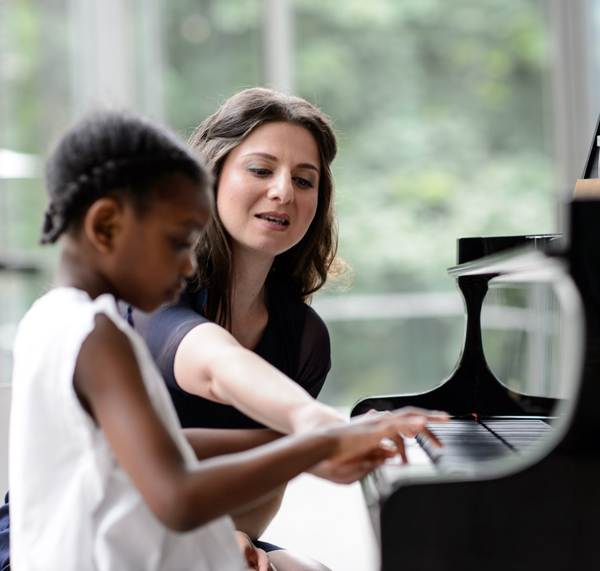 Just as your young students may feel isolated playing the piano alone at home, independent music teachers can feel as if they’re teaching on a desert island. Attending conferences provides you with new ideas, research updates, and new literature ideas. It also helps you network and learn from your peers. Sometimes the most valuable part of the conference is the lunchtime discussions. Attending a music conference also provides personal validation of the importance of your job and your mission. You will return to your studio with new ideas, renewed energy, and bolstered confidence. Change up the lessons. If you always start with scales, then move to etudes, and then end with solos, try starting with solos one week, or duets the next week, or perhaps with improvisation, or sight reading. Or you can really change things around by having your student teach you a new piece. Decorate your music room to be a fun and “happening” place. Start with a bulletin board of pictures of each student (with parental permission, of course) and of studio events. Clean up that teetering pile of books and get rid of the cold cup of coffee from that morning. Hang colorful pictures and inspirational sayings. Be excited about music even if it is “Oats and Beans.” When students hear you say, “I just love this piece,” they will too. Your excitement is contagious. Give students some autonomy by asking if they want to play two or three duets, or which of five pieces you have selected they would like to play at an upcoming recital. You can ask if they think a given section should be soft or loud, or if they would like to begin the lesson with an etude or scales. Motivate with success. Give your students a positive push. Most will only do what you ask them to do. When students don’t practice they don’t progress, and when they don’t progress they quit. High standards lead to happy students, who lead to a happy teacher. Looking for more tips like these? RCM Certified Teachers and RCM Teacher Portal Subscribers have unlimited access to expert tips like these and more. Learn more about becoming an RCM Certified Teacher or a subscription to the Teacher Portal.